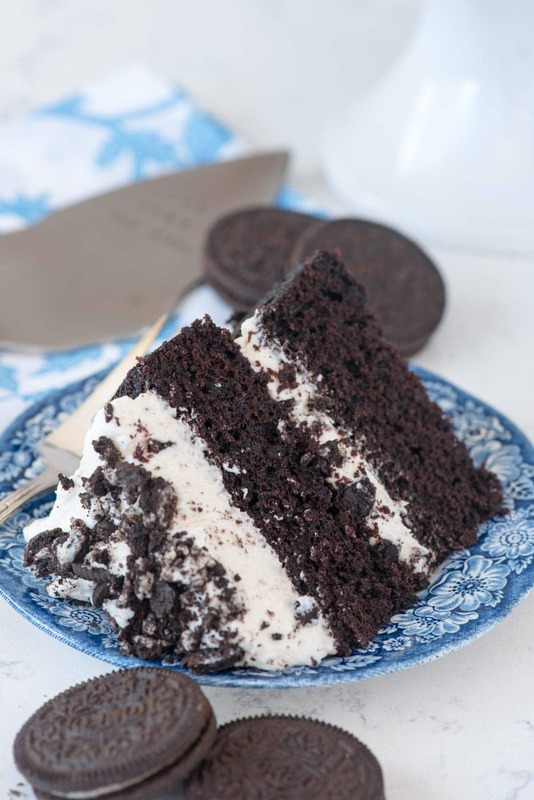 Cookies ‘n Cream Oreo Cake Roll – this EASY cake roll recipe is dark chocolate and filled with Oreo whipped cream and chocolate ganache. 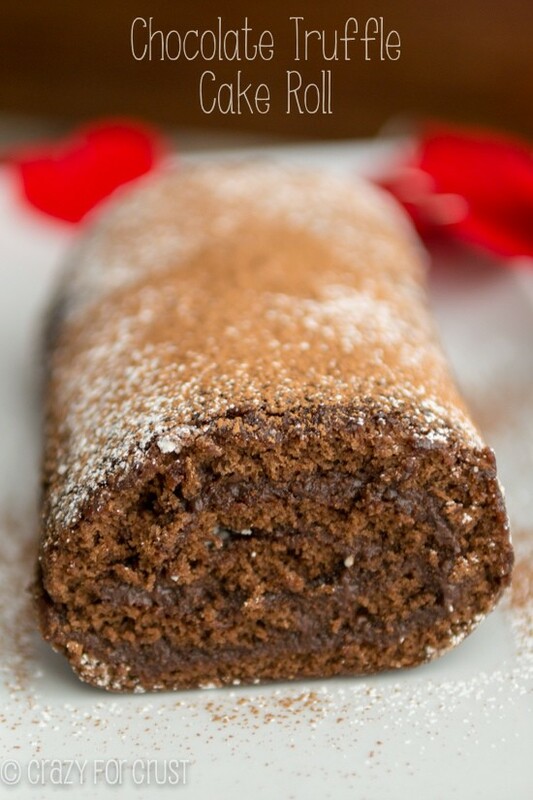 Every time I make a cake roll recipe, I think I’ve topped all my previous ones…and I certainly have this time. Hey my friends! How was your Thanksgiving? Did you shop on Black Friday? Ours was great and Jordan dragged me out on Friday, as she’s been planning all year. Okay, really, I’m lying. I have no idea how Thanksgiving was. I’m writing this on Wednesday, before the holiday. You see, I realllllllly need a break from work. The last few weeks have been hard and my body is screaming at me to STOP WORKING FOR A HOT MINUTE. So, instead of waiting to write this post all about how I deftly avoided talking politics at Thanksgiving dinner and the great deals we got at the mall on Friday, I’m knocking this post out today so that (hopefully) I can sleep through the night tonight without my to-do list beckoning me from the other room. Of course, I’ll still be pinning. And on Facebook. And checking comments (such is a bloggers life) but all of my must-do items will be checked off my list. If I’d been really good at getting things done, I would have shared this post BEFORE Thanksgiving because it’s such a great party dessert. But hey, now we’re looking forward to Christmas and there are are probably parties every weekend. 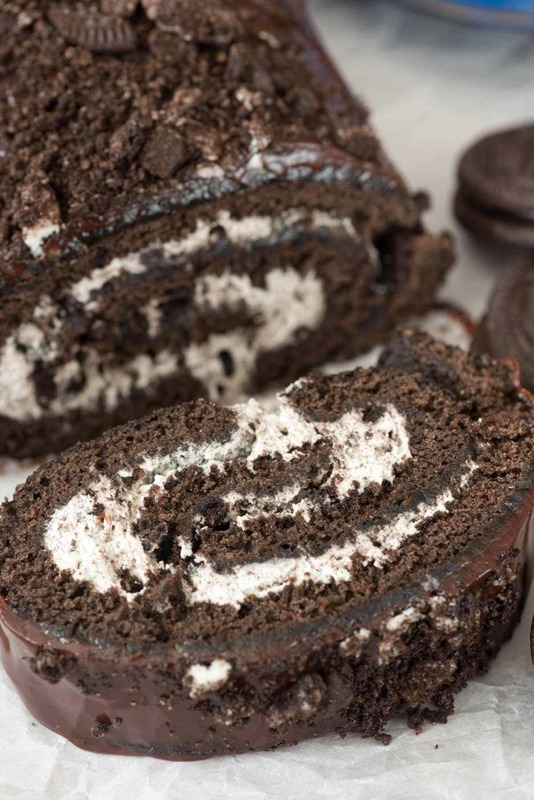 I have to say that this Oreo Cake Roll is probably my favorite cake roll recipe of all time. Okay, that’s a lie. I can’t choose. I have too many to choose from. But it ranks up there with the strawberry one and the peanut butter one. 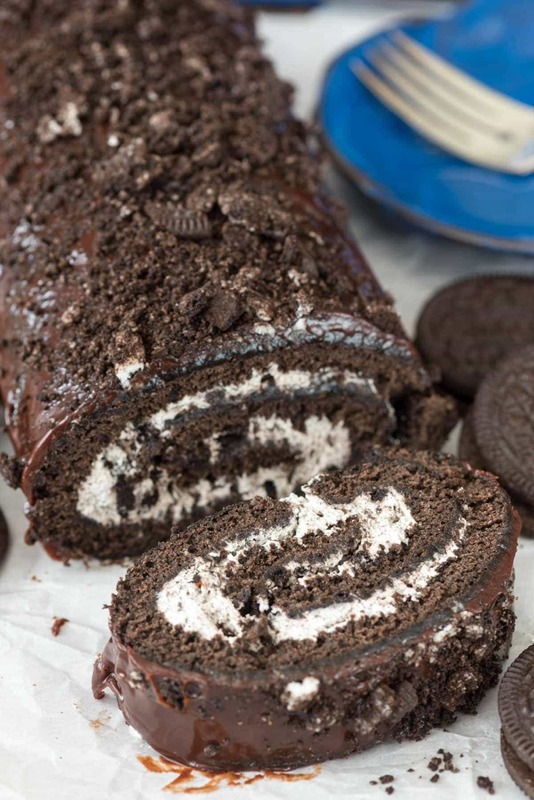 This Oreo cake roll is not a traditional cake recipe. It’s not going to be super fluffy and extra moist like a normal chocolate cake. You have to beat the eggs the amount of time it specifies in the recipe. Don’t skimp!! If you don’t beat enough air into the eggs you’ll get a flatter cake. If you’ve never made a cake roll, it’s super easy. I’ll put all the links for all my tips and tricks right above the recipe. I made a Cookies ‘n Cream filling with freshly whipped cream full of Oreo cookies. Roll the cake back up and then coat it with a chocolate ganache and more crushed Oreos. I made two of these cakes for my daughter’s class. They’re reading a book in school about a French family that lives under a bridge and it references “log cakes”. Her teacher asked me to bring these in to show what a log cake really is and to give the class a treat. According to Jordan everyone loved it! Roll it while it’s hot. 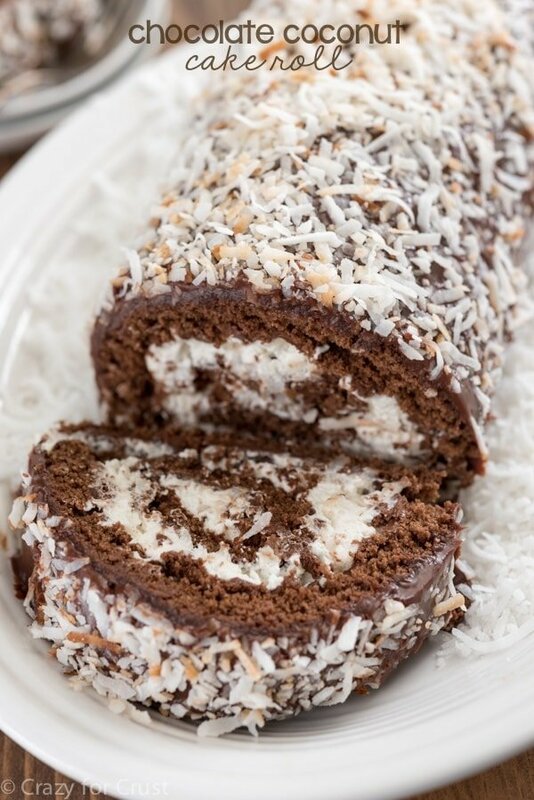 Cookies 'n Cream Oreo Cake Roll - this EASY cake roll recipe is dark chocolate and filled with Oreo whipped cream and chocolate ganache. It's decadent! Make the Cake: preheat oven to 350°F. Line a jelly roll (10x15”) pan with foil and spray with cooking spray (I like to use the spray with flour). Beat eggs at high speed for 3 minutes, until frothy and dark yellow. Beat in sugar, coffee or water, and vanilla extract. Whisk together cocoa, salt, baking powder, and flour. Stir into wet ingredients just until blended. Spread in prepared pan. Batter will be in a very thin layer and you will need to use a wooden spoon or spatula to spread it to all the corners of the pan. Bake for 10-15 minutes. You’ll know it’s done because if you lightly poke the top with your fingertip it will slightly bounce back. While the cake is baking, set a clean kitchen towel out on a large work surface. Sprinkle liberally with powdered sugar (about 1/4 cup). As soon as the cake comes out of the oven, turn it over on the kitchen towel sprinkled with powdered sugar. Remove foil carefully. Working at the short end, fold the edge of the towel over the cake. Roll tightly, rolling up the cake into the towel. Let cool completely while rolled, at least one hour (or you can wrap it overnight). Make the Filling: beat heavy whipping cream in an electric mixer fitted with the whisk attachment. (You can also use a hand mixer, but it will take longer.) Slowly add in powdered sugar and vanilla during beating. Beat until whipped cream forms. Stir in crushed Oreos, reserving a tablespoon or two for garnish. Assemble Cake: once the cake has cooled, unroll it carefully. Spread the whipped cream on the cake, leaving 1” without filling at either end. Re-roll cake, scooping out any filling that spills out as you roll. Cover with plastic wrap and chill for at least one hour before frosting. If you have leftover whipped cream, you can use it for topping, or top it like I did, see next step. Make the topping: place chocolate chips and heavy whipping cream in a microwave safe measuring cup or bowl. Heat on high power for 60-90 seconds or until the cream is hot, then whisk until smooth. Let cool for 10 minutes. Place cake roll on a wire rack set over a cookie sheet. Pour the ganache over the cake evenly. Top with remaining crushed cookies. Chill until set. Note: The cake should stay chilled until right before serving or the whipped cream filling will get warm and it will be hard to slice. 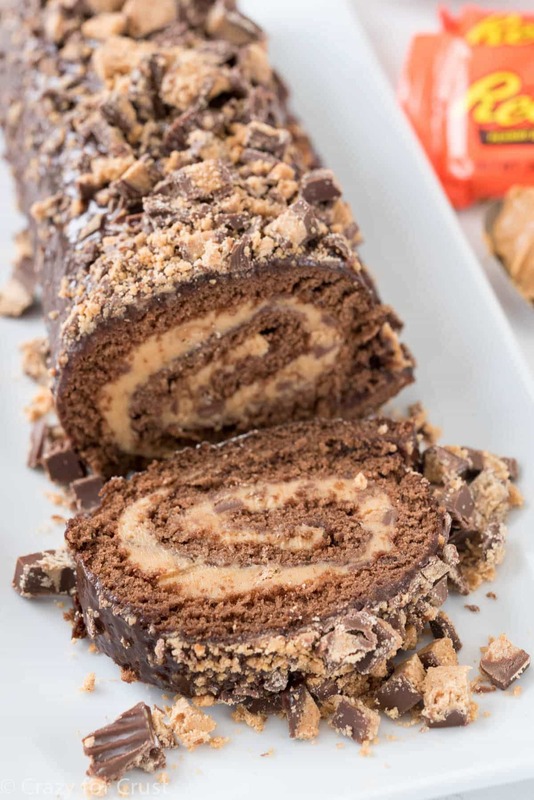 FIND ALL MY CAKE ROLL RECIPES HERE. I tried this recipe yesterday and it was a complete success, everyone loved it. Thank you very much !! Just made this and it is WONDERFUL!! The only recommendations I would make are to add 2 tbsp of powdered sugar to the heavy whipping cream and to add more heavy whipping cream to the bowl for the filling. I made this recipe to the tee and it doesn’t seem like there’s enough whipped cream for the filling. Next time I’ll double the batch so there’s more!! You could for sure add some cream cheese, just make sure it’s room temp to avoid lumps. Enjoy! Can you use a cake mix or do you have to follow the cake recipe for it to work? Looks delicious! Thanks! Love this cookies n cream oreo cake roll! So yummyyyy!!!! Mine and my friend both made one and it was dry? It said to use an 11×15 pan. Thw biggest I can fit in my over is 11×13 do you think that will work? I made this this weekend, and it is divine, I have come to love every recipe of yours I’ve tried, which is GREAT! I follow other blogs but they are hit and miss on if we try and like them, but yours hit the nail on the head every time! Love to bake but never made a roll cake before. When you say kitchen towel do you mean dish towel or paper towel? Cause I’m wondering if it’s a dish towel even with the powdered sugar on there wouldn’t the terry fibers get on the cake? But. Paper towel is thin so not sure which you are referring to. Tx? How come no video on cookies and cream roll cake. Can I use cake flour instead? Thanks! Just made this ! Its turned out well and taste good too. Only thing I’m confused about is the filling didn’t seem to be enough, i really had to scrape it out to cover it entirely but in the photos here its a nice thick layer in between. Is is meant to be 1 & 3/4 cups cream maybe ?